Office 365, the fastest growing commercial product in the history of Microsoft, fits the way you work. Using the familiar Office apps you know and the power of the cloud, Office 365 lets you work virtually anywhere, anytime, across your devices. No matter how you access and use Office 365, you receive the same seamless experience and enterprise-grade security to protect your business and customers. There are no big upfront costs and no worrying about upgrades. Just the tools you need to do what you do best. Online or offline, your team can work together to get more done using fully-featured Office apps accessible on PCs, Macs, smartphones, and tablets. Stay connected and save important emails with business-class email and up to 100GB of mailbox space and 50GB to unlimited archive. Protect your business and employees from malware, spam and unauthorised access with always up-to-date data and email and device protection. Store, sync, and share files with OneDrive for Business and SharePoint. Collaborate with team members and join online meetings with one click from any device. 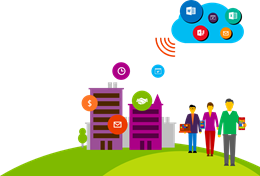 Get the most from your investment and run your business the easy way with Office 365. And because it’s Microsoft, you gain peace of mind knowing that everything works together seamlessly and provides the security you need to protect your business.